Manchester United strolled to victory to leave Celtic's Champions League hopes hanging by a slender thread. Dimitar Berbatov looked offside when he flicked home a close-range finish to put United ahead after 30 minutes. And there were similar doubts about his second, turned in on the rebound after Celtic keeper Artur Boruc could not hold Cristiano Ronaldo's free-kick. Wayne Rooney emphasised the gulf in class between the sides with a 20-yard shot on the turn with 14 minutes left. United are now sitting pretty at the top of Group E and on course to qualify for the knockout stages, but Villarreal's win against Aalborg leaves Celtic with an uphill task to emerge from the group phase. 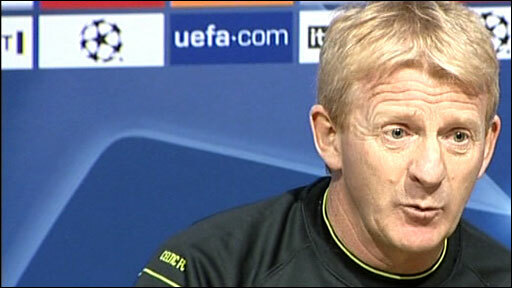 Gordon Strachan's side was below-strength and it showed as they never looked like making a dent in a dismal Champions League record on their travels that now reads played 17, lost 16 and drawn one. But they will also point to two debatable United goals, although in reality they were massively inferior to their English counterparts. Manchester United lost Rio Ferdinand with a groin injury, but Ronaldo kept his place despite speculation that he might be rested - and he played his part in a vibrant first-half display from Sir Alex Ferguson's side. It was Celtic, however, who posted the first danger after 11 minutes when Aiden McGeady forced Edwin van der Sar into a save low to his left with a 20-yard shot. United went ahead on the half-hour, but it was a contentious moment that will have left Celtic and their massed ranks of supporters nursing a sense of injustice. When John O'Shea jabbed the ball into the danger area following Nani's corner, Berbatov was clearly in an offside position as he flicked a finish beyond Boruc. Scotland captain Darren Fletcher should have made it two on the stroke of half-time when he cut inside and shot over the top from only 12 yards. United doubled their lead six minutes after half-time, but again Celtic will ask justifiable questions about the legitimacy of the goal. Boruc could only palm out Ronaldo's vicious long-range free kick for Berbatov to turn in the rebound, but the Bulgarian appeared to be in an offside position when the ball was struck. Rooney had the ball in the net again seconds later but it was ruled out for offside, although this time it was United who could ponder a questionable decision. 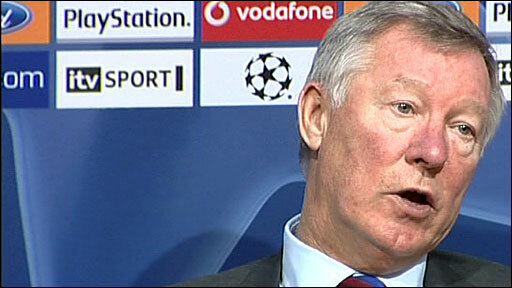 Ferguson made a double change on the hour, sending on Carlos Tevez and Wes Brown for Berbatov and Gary Neville. And the Argentine almost got in on the act instantly with a 25-yard shot that was deflected just inches wide. Celtic had sent on substitutes of their own, with Paul Hartley and Shaun Maloney replacing Barry Robson and Shunsuke Nakamura - but they were having trouble creating any clear-cut opportunities. And they were powerless to stop United as they swept forward to add a third with 14 minutes left, almost inevitably through Rooney. A move that started with Van der Sar's throw out ended with the in-form England striker scoring on the turn from 20 yards to make it nine goals in seven games for club and country. It was a fitting flourish to another outstanding display by Rooney as United continue to move ominously into top gear. Man Utd: Van der Sar, Neville (Brown 59), Evans, Vidic, O'Shea, Ronaldo (Park 82), Fletcher, Anderson, Nani, Berbatov (Tevez 60), Rooney. Subs Not Used: Kuszczak, Giggs, Rafael Da Silva, Gibson. 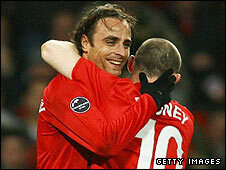 Goals: Berbatov 30, 51, Rooney 76. Celtic: Boruc, Wilson, Loovens, McManus, Naylor, Nakamura (Hartley 61), Scott Brown, Caldwell, Robson (Maloney 61), McGeady, McDonald (Sheridan 77). Subs Not Used: Mark Brown, Hinkel, Donati, O'Dea. BBC Sport Player Rater man of the match: Manchester United's Wayne Rooney on 8.06 (on 90 minutes).